The other day, my soil test results came in by email from Colorado State University’s Soil, Water and Plant Testing Laboratory. As I opened the attachment, I felt a little trepidation, not unlike anticipating getting my cholesterol numbers from the health fair. Both tests document my progress in healthy living–or making healthy soil–within the limits of genetics–or bedrock. My front lawn’s pH was high at 7.4, but my vegetable garden was 7.2, within the preferred range of 6 to 7.2. So I have alkaline soil—typical for this region. Most plants will still grow fine, except for acid-loving species. Because acidification treatments cost money and are not long lasting, we Westerners should instead take advantage of alkaline-loving plants. Local gardeners often talk about Cheyenne’s clay soil texture so I was surprised my vegetable garden tested as sandy loam and the front yard as sandy clay loam. “Loam” describes the perfect combination of sand, silt and clay particles for horticulture and agriculture: just enough sand for good drainage, just enough silt and clay to hold water and nutrients. The modifier “sandy” means water will drain more quickly. This explains why I needed to water the veggies every morning last summer. With “clay” in the lawn’s soil texture description, it means it holds water well, but percolation is slower. That means when you water, apply it slowly. In my vegetable garden, organic material tested at 3.9 percent. This isn’t bad for an area that was first cultivated a year ago and amended with leaf compost. The recommendation is to increase this category to 5 percent over the next two or three years by adding 2 to 3 inches of plant-based compost or 1 inch of animal-based compost in spring or fall, incorporating it into the top 6 to 8 inches of soil. The front lawn, which I would love to convert to flower garden, came in at 4 percent. Though I can improve that, less may actually be better for native, drought-resistant plants I would choose. Without it, soil would be nothing but weathered rock. Yes, you get many nutrients from minerals, but organic material feeds the soil microorganisms which feed your plants. The process also improves soil structure, which improves water permeability and absorption (think lower water bill). There can be as many as a billion microorganisms in a quarter teaspoon of topsoil. They are the real engines of plant growth. Remember where organic material comes from? Plant and animal matter. It’s a cycle as old as life. Sometime during the 20th century, chemists determined plants could grow with nutrients from chemically processed mineral salts. Today, it is common knowledge that highly processed fertilizers don’t feed microorganisms the way organic (plant and animal-based) fertilizers do. And sometimes they leave behind a buildup of salty residue that is hard on plants. Unfortunately, the big fertilizer companies have become so influential that it is not always easy to pursue what we now call organic gardening and farming—back to the future, as I think of it, since organic growers use Grandpa’s pre-chemical farming knowledge augmented by new discoveries about organic materials. The vegetation of natural landscapes is the result of perfect nutrient cycling. However, gardens and lawns are more intensively grown and the natural nutrient cycle often needs our help. We have a tendency to over-fertilize, which pollutes groundwater and surface water with the excess, and wastes our money. As I read labels on various bags and bottles, I realized perhaps the reason we over-fertilize because many of us have trouble understanding the labels. And so we calculate fertilizer amounts as best we can–and then throwing in a little extra for good luck. Actually, we should err on the side of less. It’s surprising we don’t kill everything growing in our yards with our generosity. I confess to being stingy. In the days I only grew perennial flowers, I never fertilized with anything other than decomposing leaf mulch. Mark uses Revive, an organic fertilizer, on our lawn. But now, thanks to my soil test, I have actual numbers to strike a balance between stingy and overgenerous. Both my lawn and vegetable garden were low in nitrogen. Nitrogen is one of the three major nutrients, the one responsible for stems and leaves. But if you put too much on in one year, it interferes with producing flower and fruit buds and the excess disappears before the next growing season. Surprisingly, in my vegetable garden, this came in high. But the lawn needs some. Phosphorus gives plants strong roots, resistance to disease and good fruit development. Again, the vegetable garden came in high, and the anaylsis recommends adding a bit to the front yard–if I convert it to flowers. Plants need potassium for successful blooming—for flowers and fruiting vegetables like tomatoes. Electrical conductivity: In both areas of my yard, electrical conductivity was low, a good thing, meaning no salty, plant-killing soil. Lime: Rated medium, OK for growing plants. Why a local store sells lime is beyond me. With very, very few exceptions, adding lime to Wyoming soils will only increase alkalinity, perhaps to toxic levels. Micronutrients: Zinc, iron, manganese, copper and boron are all necessary for healthy plants but, as in my yard, they are seldom deficient here. All processed fertilizers, whether they are chemically manufactured or lightly processed organic—meaning carbon-based, not necessarily organic as in growing method—have their N-P-K percentages listed on the label. The plants don’t care where these nutrients come from. But organic-based fertilizers release nutrients more slowly, provide some of that all important organic material, and they are safer around children and pets. Needing just nitrogen for the vegetable garden, the soil test results recommended urea or ammonium sulfate, or one of three more organic choices: blood meal, corn gluten meal or alfalfa meal pellets—for that final item, think rabbit food. The lawn needs three times as much nitrogen and phosphorus, by weight, as it does potassium. None of the “balanced” fertilizers containing all three really came close to these proportions, so I also looked at the individual recommendations for phosphorus and potassium. For phosphorus it was either bone meal (organic) or triplesuperphosphate (chemical). For potassium, potassium chloride or composted manure. Chemical fertilizers are available at garden centers all around town. Some of the organics are common as well, such as bone meal. Grant Farms has a good selection of fertilizers from organic materials. For corn gluten, cottonseed meal and alfalfa pellets, check A & C Feed. 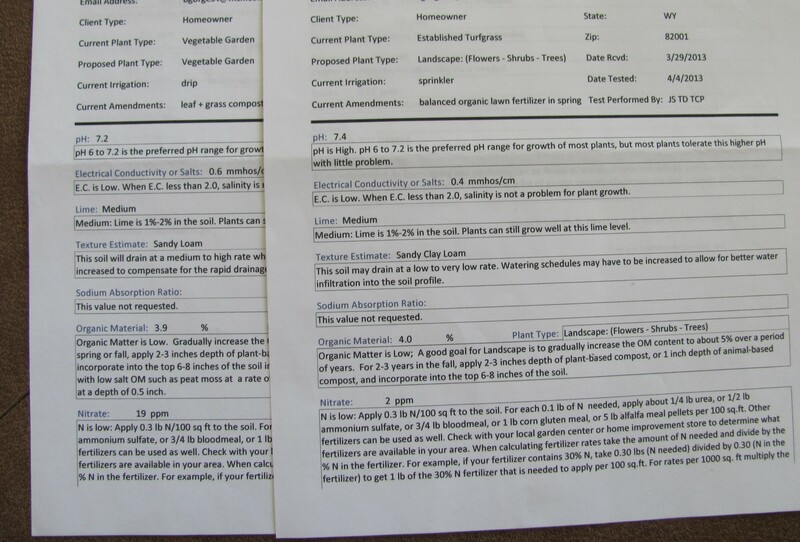 My soil test result sheets explained how to figure out how much of the unconventional fertilizers I needed—after all, alfalfa pellets don’t come with nitrogen-phosphorus-potassium analysis. Essentially, for my 100 square foot garden I only need a pound of 30 percent nitrogen fertilizer—15 pounds of alfalfa pellets that will provide organic material as well. Perhaps my leaf compost can substitute for some of that. I think I can spread fertilizer over my tiny garden evenly by hand before digging it in, but the lawn, if I don’t convert it to garden this year, needs one of those spreaders for which you can adjust the rate. On the other hand, a mature lawn doesn’t need fertilizing until late summer, so I can put that off for now. But when we mow we should start leaving our clippings on the lawn to decompose. They will not become thatch—other issues cause thatch build-up. In four or five years we can do another soil test and see how we’ve progressed toward our goals. Always read fertilizer directions thoroughly—and follow them for best results, and for your own health. Think twice about using manure. If it’s fresh, it may burn plants. Avoid pig, dog or cat manure because their diseases can last years in soil and travel via vegetables to humans. And if manure from herbivores isn’t composted at high enough temperatures, it may carry viable weed seeds. Be aware of how much salt comes with the fertilizer of your choice. Organic materials from your own yard—unless sprayed with pesticides or diseased—are not yard waste. They’re treasure. There are many fertilizer sources I haven’t discussed that are worth looking into, such as fish emulsion and cover crops that become green manure, among others. If you have questions on how to improve soil, it may be worth consulting an expert, especially at one of the local agencies that offer free advice. You can also find out from them how to get your soil tested. Also, check their websites or offices for bulletins with garden advice tailored to our area. **Laramie County Conservation District, 11221 U.S. Hwy 30, 772-2600, http://www.lccdnet.org. **Laramie County Cooperative Extension, 310 W. 19th, 1st Floor, 633-4383, http://www.wyomingextension.org/publications/. **Cheyenne Botanic Gardens, 710 S. Lions Park Dr., 637-6458, http://botanic.org/ (gardening advice specifically for Cheyenne). Categories: Soil testing results | Tags: Cheyenne Botanic Gardens, Colorado State University, fertilizer, Laramie COunty Conservation District, Laramie County Cooperative Extension, Organic material, pH, Soil, soil test, soil test interpretation, soil test results, soil texture, vegetable garden, Water and Plant Testing Laboratory | Permalink.